Bears symbolize introspection and intuition blended with instinct. To both European and Native American Shamanic people, Bear symbolizes awakening the strong force of the unconscious. The strength of bear medicine is the power to restore harmony and balance — to heal. The Bear Spirit is known to many cultures as the Great Healer. 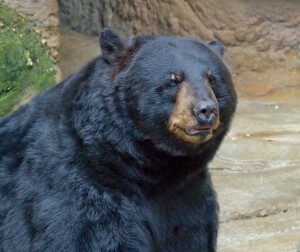 Bears are considered the Embodiment of Spiritual Power and Physical Strength. Rarely seen, bears seemingly live as spirits, without a body — visible to the eye only as foot prints in the sand — traces of passing left behind by great mythical beings from the Land of Spirits. Bears, constant in their conviction have walked the same paths generation after generation, wearing deep furrows into solid stone. Bears were thought to die each fall, to be reborn each spring, verifying in life, their Spiritual Power over death. Proof, that Bears were given the Power of Resurrection through Rebirth. Hibernation; the great sleep; entering into the Spirit World for spiritual re-alignment and emerging in Spring as changed and balanced beings. Bears awaken from their long journey in the spirit world, having become greater in spirit and lesser in body. We could see a metaphor of the shedding of fat symbolizing the shedding of worldly goods & being reborn. Bears, jubilant in their return, rejuvenated by their physical and spiritual rebirth, they emerge from the womb of our Mother, the Earth, through the exits of their dens. Leaping and bounding like children bonding with their Mother, the bears knead the Earth to awaken, needing Her to renew all things, so Her children might be fed. Refreshed and invigorated from a long and restful winter, they honour Her with sounds of joy and dances of renewal. Thankful for the gift of life, they stand erect, with outstretched arms, a sign of allegiance honouring their Father, the Sun, thanking Him for His warmth and the gifts of love that He provides for all living things. Thus begins, the annual rites of renewal that all life might be awakened and all things renewed. Root it deep within my core. And Healing touch in Paw. AWAKEN THE BEAR IN ME!!! The Great Bear throughout the ages has been linked to the gods and goddesses of royalty and immortality. 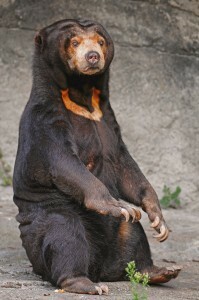 In Latin Ursa Major means “greater she-bear.” In Greek, Arktos is the word for bear. 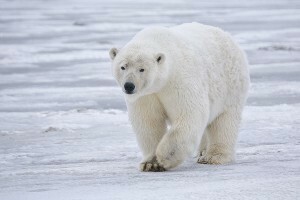 Hence the name Arctic, which means bearish and describes the far northern parts of the earth where the Great Bear constellation dominates the heavens even more than in the northern hemisphere. It is important to know that Bear, as the Teacher of Medicine, is the ‘speaker’ for all animals and about the nature of the world within which we live. For example, for the Tlingit people (Northwest Coast, USA), Kasha is the Great Mother who gave birth to all of the animals. They called her Animal Mother and also referred to her as Bear Mother or as Strong One Mother. When the World was new, Bear Mother gave each animal the form it has today. She nursed them and when one cried, She rocked it in a large Moosehide hammock stretched between four mountains. As they grew, She protected them. She taught them what food to eat and how to get along. She Bear, this Mother Bear who promised to renew our understanding about how to live in this world if we come and spend some time with her. Archaeologists and anthropologists have not always fully appreciated the significance of the Bear for our ancient peoples. As an example burial sites have been found throughout California which clearly indicate the mystery, awe, and spiritual respect which these peoples had for Bear. One picture I saw has always stuck with me — a bear cub and a child are buried together. The bear was buried directly behind and parallel to the child and with the arms of the cub surrounding the child. A large acorn pestle was found in the hand of the child (which may indicate the child was a female since evidence indicates that women did the grinding of the acorns to produce food). A number of shell and stone beads were found in the area of the child’s neck and chest: The beads are of a style which allowed them to give this site an approximate date of 1500 A.D. Such burial sites, found throughout California, and similar sites of human and bear skeleton remains together, found throughout the world, remind us of human’s special relationship with Bear. A friend of mine, who has been a wonderful mentor for me, shared a soul retrieval experience she had years ago. While journeying to retrieve her patient’s “fetus soul,” which was fragmented and split off while in the womb, she was taken to a Cave in which this Mother Bear was suckling the fetal and at the same time suckling her own Bear Cub. Subsequently, for her, she discovered that Mother Bear often has the “lost souls” of children and she tends them until they are returned to an individual during soul retrieval. In my own experience I have had Bears accompany me and the “Spirit” of a person after they had died. The most painful and profound experience I had with Bear as my personal healing was spontaneous. Spirit, in its wisdom, took me deep deep into myself to help me release my dead sister’s soul from my deepest psyche. At the end of my journey my sister’s body; which had been lovingly washed and wrapped in a death shroud, was placed upon Bear’s back and taken out of my ‘collective’ reality/psyche to… wherever she was taken. Those of us walking the spiritual path need times to ritual together; we need a sacred space in which to explore, nourish ourselves and develop robustness of heart, of courage, and hold a vision that is based on a positive sense of Wholeness — or Wholeness restored when otherwise we would feel fragmented. Bear Shamans and Bear Medicine Societies are present in many forms in many different, diverse and distant peoples. No two Bear Shamans were ever the same, and how could they be? However, there are certain elemental qualities that characterize the spiritual Bear. Any hunter could tell you how the great claws of the bear can rip through trees and brushes, or dig deeply and with passion into ant hills. 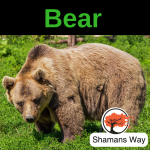 Bear Shamans can use the gifts of their bear claws to dig deep into a body to remove what does not belong. Bear Shamans have been known to be great healers of deep wounds, as well as being known for healing bones. There are also Bear Shamans who have claimed to have power over life and death, taking on the resurrection mythos of the Bear. I have read some very interesting accounts of Bear Shaman healing and I can only imagine how it would feel to be a part of such power-filled and long standing ceremonies. Great healers, like the Bear, restore balance and harmony. The Bear is the keeper of the dream time, and stores the teachings of dreams until the dreamer wakes up to them. Many tribes have called this space of inner-knowing the Dream Lodge, where the death of the illusion of physical reality overlays the expansiveness of eternity. It is in the Dream Lodge that our ancestors sit in Council and advise us regarding alternative pathways that lead to our goals. When I enter the Dream Lodge and sit with my Elders and Ancestors I feel wisdom surround me. I seek my inner silence and peace as I sit with them. Bear has stood over me and together we have looked into the great valleys of dreams. Bear, the Spirit of the Between worlds. 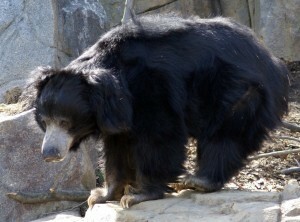 Bears are active during the night and day. To our Ancestors, as well as to us, this symbolizes its connection with solar energy, that of strength and power, and lunar energy, that of intuition. By embracing the wisdom of the Bear we take the lessons within I ourselves to learn how to balance both. From ancient times to current day; for those who track Bear’s ways, Bear is the “Walker between and among the worlds.” She is the Great Mother, the One Who Carries the Spirit to Beyond; and she is the one within this Earthly world who also teaches us. Bear teaches us how to move between and within Heaven and Earth. Bear waits for us to answer Her Call to walk through this wilderness, to descend into the dark, moist Cave & experience what the Spirits wish to share. Bear ascends with us into the Light, transforming the alchemical mysteries of darkness within light and light within darkness into some deeper knowing of Coming Home, Going Home, and Being Home for All. For those drawn to Bear I recommend seeking her through journeys in four forms. Sky Bear. The Bear who turns the world, found in the upper world. Earth Bear. The Bear who shows the way, found in the middle world. Cave Bear. The Bear who births the world, found in the lower world. Spirit Bear. The Bear who dreams the world, found in dreams. Powers of the Upper World; The Great Bear — Sky Bear — The ever constant wanderer. You who can spin the night skies, the Dream Keeper. Powers of the Earth Bear — The Powers of the Middle World, the Known World, the Silent walker between the worlds — Sharing consciousness in the Womb of Earth. Powers of Bear that Births the World — The Lower World — to the caves of the worlddeep and hidden in those caves we honor your altars, your bones, carvings, all sacred art, the Cave Bear — The ancient of the Bears — The Wisdom Keepers. The Bear Dreamers — Bear who dreams the world, Keeper of the Dark, remembrance of the deep and powerful energy of the Dream — you who dream the world into existence and dream it back into history — the keeper of the collective stories. To all our bears we welcome you. Looking for even more on Bear? 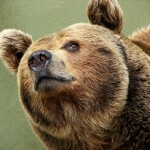 An article on Waking the Bear, a shamanic spring ceremony. Companion podcast to this article. Waking the Bear, a springtime ceremony. Originally published at Shamans Way. In learning to see the world as shamans, we reconnect with ourselves, and can adapt much easier to the world around us.